Its 1978. A packed audience at the UC theatre in Berkeley, California, watches on as a man eats his shoe. The act coincides with the U.S. premier of American director Errol Morris’ first major film project, Gates of Heaven, a documentary on American Pet Cemeteries. The man is eating the shoe Werner Herzog. The story goes, Herzog – the seminal German New Wave director – made a bet with his protégé Morris, that he would eat his shoe if Morris ever completed Gates of Heaven. Notorious for his failure to stick with any of his previous engagements (stints as an Ivy League science student and fiction writer already left in his wake), the chances of Morris completing the film had originally appeared slim. And yet – the near impossible occurs, by borrowing, begging and stealing the film is made. And so, a shoe has to be eaten. To digress briefly, it is Restoration period England that first produces the language of clothing consumption as an exemplary limit point against which certainty and confidence in speculation can be graded. Charles the II or “Old Rowley” as he was sentimentally known, was a King famed for his salubrious headwear. During this period one might have been heard convicting a given speculation with the offer to ‘eat old Rowley’s hat’ if the unlikely event was to in fact transpire. Be it a hat or a shoe, the essence of this type of declaration has remained unchanged to this day. Concurrent with its historical origin, it would appear that Herzog’s offer and the doubt it suggests, arises as an expression of negativity towards Morris. However we might consider an alternative reading and take it instead as a pure statement of encouragement directed at a gifted though errant protégé. The offer to eat his shoe illustrates Herzog’s deep-felt belief in the artistic potential of another – the unusual feast, then, as creative catalyst. Herzog provides a commentary to the film, which he uses a battle cry for unrestrained creativity. Advocating any means at all, theft, fraud, subterfuge, to realise a film project, Herzog’s commitment to production at any costs transforms the undeniable farce and humour, the high ceremonial pantomime and performance of this particular public consumption, revealing a further, deeper, truth. So when Herzog addresses both audience and camera, he does so with the jouissance of a man bathed in the light of another’s creative emergence against all odds. Werner Herzog Eats His Shoe is a testament work by Blank, a lesson to all striving to create in any field. The near messianic zeal that infuses the film is designed to motivate and inspire with its simple message: in the face of the limitations we all experience on a daily basis, the only ever viable answer is action, relentless action. Les Blank (b.1935) is a filmmaker living and working in El Cerrito, California. He established Flower Films in 1967 and has directed and produced films on subjects as diverse as Garlic, famous Tea importers, and gap-toothed women. 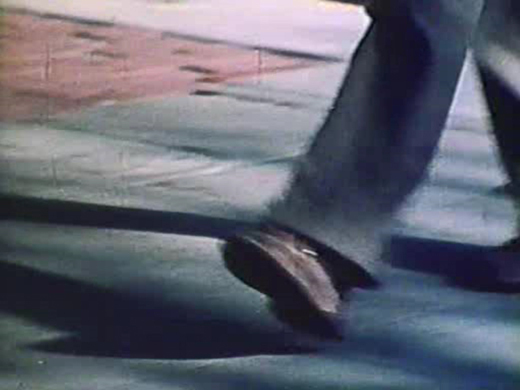 Werner Herzog Eats His Shoe is shown courtesy of Les Blank and Flower Films. For more information on further films by Les Blank visit: www.lesblank.com. Errol Morris (b. 1948) is an Oscar winning documentary filmmaker. Having talked his way into Princeton University to unsuccessfully study the History of Science, he moved on to study philosophy at Berkeley University. Again failing to complete his studies he left academia for good before meeting Werner Herzog in the mid 70’s. Gates of Heaven was Morris’ first feature and though premiered in 1978 was only given limited release in 1981. In 2004 Morris won an Academy Award for best documentary feature for his film The Fog of War (2003). Werner Herzog (b. 1942) has had a forty-two year directorial career that has seen him emerge as one of the leading lights in alternative cinema. He has so far directed over forty films including Aguirre, the Wrath of God (1972), Heart of Glass (1976), Stroszek (1977) and Fitzcarraldo (1982) for which he won the Best Director award at the Cannes film festival. Recent projects include Grizzly Man (2005) and Rescue Dawn (2007).